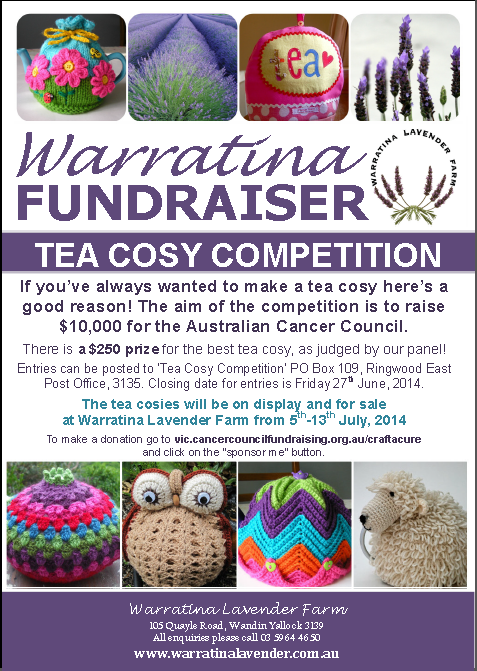 It's on....the Tea Cosy Competition All tea cosies will be on display and for sale at Warratina Lavender Farm from the 5th -13th July, 2014. Please support our fund raising effort for the Cancer Council. To be eligible to win the cash prize, attach your name and phone number to your entry. The tea cosy that is judged to be the best by our judging panel, will win first prize of $250. 3. Tell your friends about the competition; we need you to make lots of tea cosies. This is our first ever tea cosy competition to raise money for the Cancer Council. Get knitting, crocheting, sewing, or glueing, to make a tea cosy. You can post it to Tea Cosy Competition, PO Box 109, Ringwood East Post Office, 3135.